Somewhere around the turn of the century my son tried to introduce me to Dream Theater with this CD (I had never heard of them so, therefore, I was skeptical of their prowess). His thinking at the time was that his geezer Dad might enjoy hearing his favorite band play Elton John's epic "Funeral for a Friend/Love Lies Bleeding" so one day he popped the disc in the player and away we drove. After listening to it as well as the remaining copy songs (he skipped the title cut) I told him I thought they were a damn good bar band but in my head I wondered why they had put out an album of covers. In the end I really wasn't all that impressed and pretty much forgot about the group until I finally got converted last year by the stunning "Scenes from a Memory" and became a huge fan. I bought six of their public offerings but not this one. 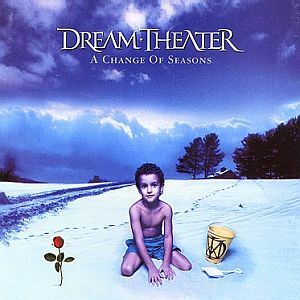 I got "A Change of Seasons" as a gift recently and have tried hard ever since to get into it but I have to say that it's just not making it for me. Of course the title tune is the only original so I'll give you my take as honestly as I can. It starts promisingly enough with a very interesting acoustic guitar passage from John Petrucci but it leads to a somewhat predictable section that mainly consists of a repeated heavy metal riff. When we arrive at the verse it is clear within minutes that this isn't their most memorable melody in that it just seems to meander. Hope is briefly revived for the song when the acoustic guitar reenters and creates a soothing atmosphere with a surprisingly passionate vocal from James LaBrie. John Myung takes a nice turn on the bass before a frantic and unsettling forced sequence begins, taking us to a series of staccato runs that just aren't as cohesive and cleverly pieced together as I've come to expect from these talented composers. Once that is passed the mood swings back down to the uninspired verse again. Maybe they should have ended it all right there but they speed it all back up for the keyboards and guitar to show off. LaBrie then gallantly tries to bring it to a big ending but it just falls flat for me. The return of the opening acoustic guitar to bring it full circle is a nice touch yet it's too little too late. Here's my theory as to why it falters in comparison to their other extended songs. Keyboards are a huge part of Dream Theater's writing and, since this album features a guy named Derek Sherinian instead of Kevin Moore or Jordan Rudess, I have to think that they didn't receive the necessary inspiration from that section of the band to save this piece. Plus the usual incredible drum sound is missing from Mike Portnoy's kit and at times his snare sounds very thin to me. I recently discovered "Raise the Knife" on Score and I find it to be kinda like this tune but a much better song in almost every way. Every Dream Theater composition can't be a monster but I still admire the effort. They still play their fannies off. As for the cover tunes, I know they had a ball playing songs that they adore and I can tell the audience enjoyed it, too. (Back in the 70s I performed in a bar band for many years and the thrill of playing music that you love is hard to beat.) But will I find myself wanting to hear their version of "The Rover" over and over? No. But maybe that's just me. When all is said and done I look at "A Change of Seasons" as merely a temporary lull in an otherwise stellar career.